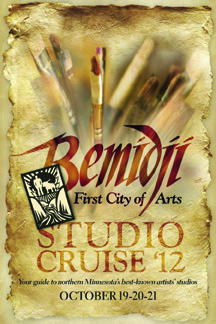 Bemidji’s Studio Cruise ’12 this Fri-Sun! The Bemidji – First City of Arts Studio Cruise is a self-guided tour of the studios of artists working within a 40 mile radius of Bemidji that is free and open to the public. Over the course of three days the public is invited to visit participating artists in their creative space. Studio Cruise dates and times are October 19, 20 (10 AM to 5 PM) and October 21 (10 AM to 3 PM).